By the time the clouds cleared, the snow covering the mountaintops had washed away. But, hoo boy, was it ever cold! I definitely needed some comforting hot soup. What’s better than garlic soup to chase the chill of a January day? Comforting soup for a winter day. 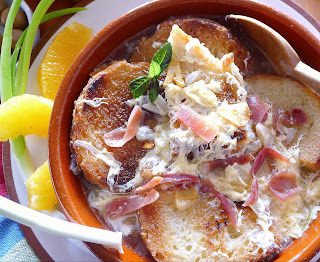 This Andalusian garlic soup has egg and strips of ham added to the slices of fried bread and garlicky broth. 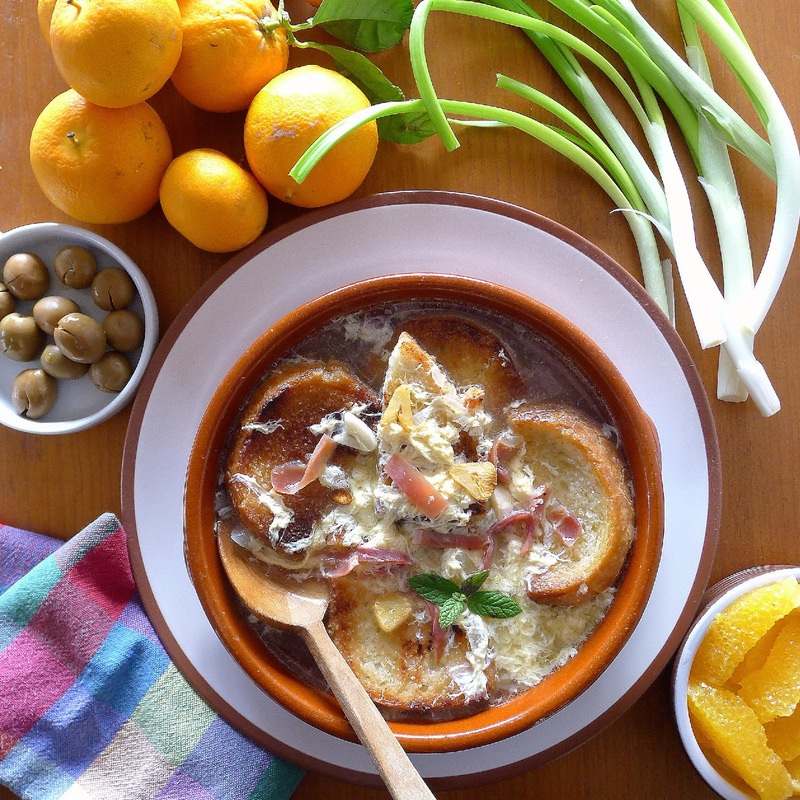 Oranges, green onions and olives accompany the soup. This is maimones, the Andalusian version of garlic soup. 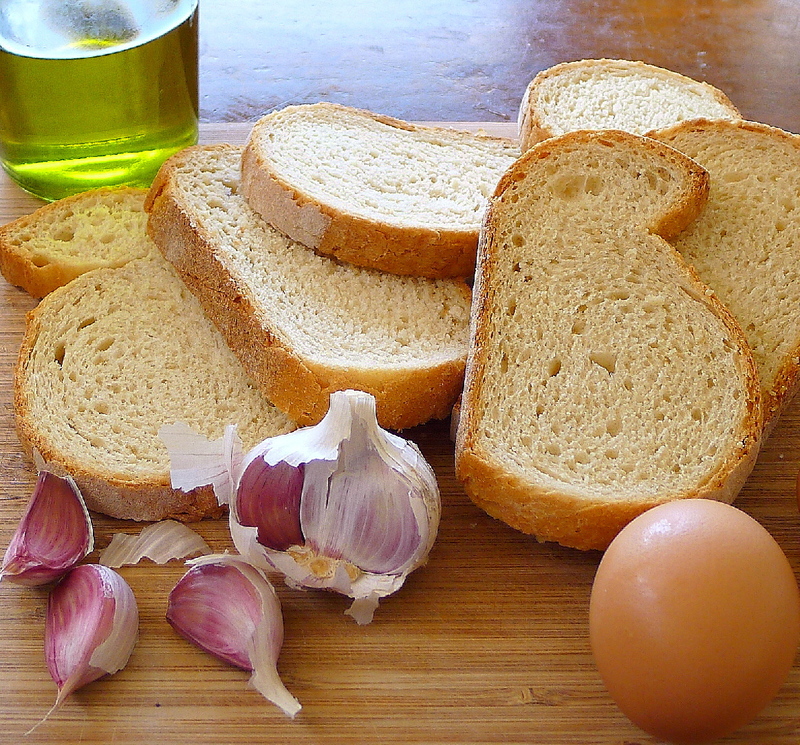 At its most basic, it consists of frying garlic in olive oil, adding a quantity of stale bread, water and salt. Boiled a few minutes until the bread begins to soak up the liquid, the thick soup warms the body and fills the belly. This is poor folk's food, a way to feed a family or a gang of jornaleros, day laborers, working in the olive groves, vineyards or wheat fields. Before there were packaged baby foods, maimones was an infant’s first solid food, easy to mash to a pap. Basics for garlic soup: virgin olive oil, dense-crumbed country bread, garlic and eggs. The garlic soup belongs to a category of poor-folk’s soups in which the principal ingredients are bread and olive oil. 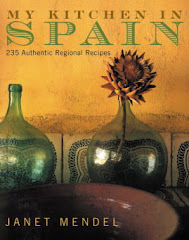 There are dozens of variations on the theme, some with wild asparagus or the addition of a tomato sofrito, a spoonful of pimentón (paprika), a squeeze of sour orange juice, crushed almonds or pieces of salt cod. Eggs and chopped ham are typical additions. My rendition is a souped-up version—I’ve used home-made chicken stock instead of water. But, the flavor and substance come from good virgin olive oil (I finished the olive picking with 55 liters of oil!) and lots of garlic. Day-old country bread with a dense crumb is best. Use whole-grain, if you like. The sliced bread is first fried in oil, then added to the soup to soak up some of the liquid. The eggs are stirred into the hot soup creating lacy strands. 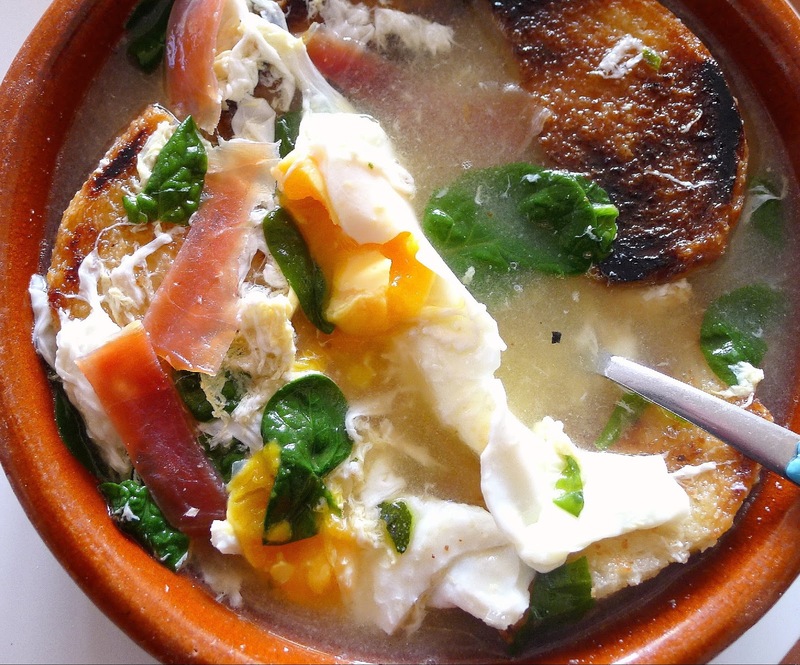 Alternatively, one egg per person can be poached in the soup and ladled out with a slotted spoon and placed on top of the fried bread in individual soup bowls. 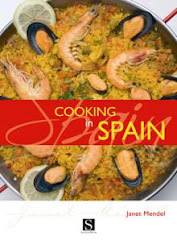 Campesino-style, maimones is accompanied by oranges, olives and green onions. 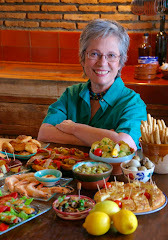 In the summer, peeled cucumber sticks, melon or grapes are the sides. You slurp up some soup, then take a bite of the accompaniment. 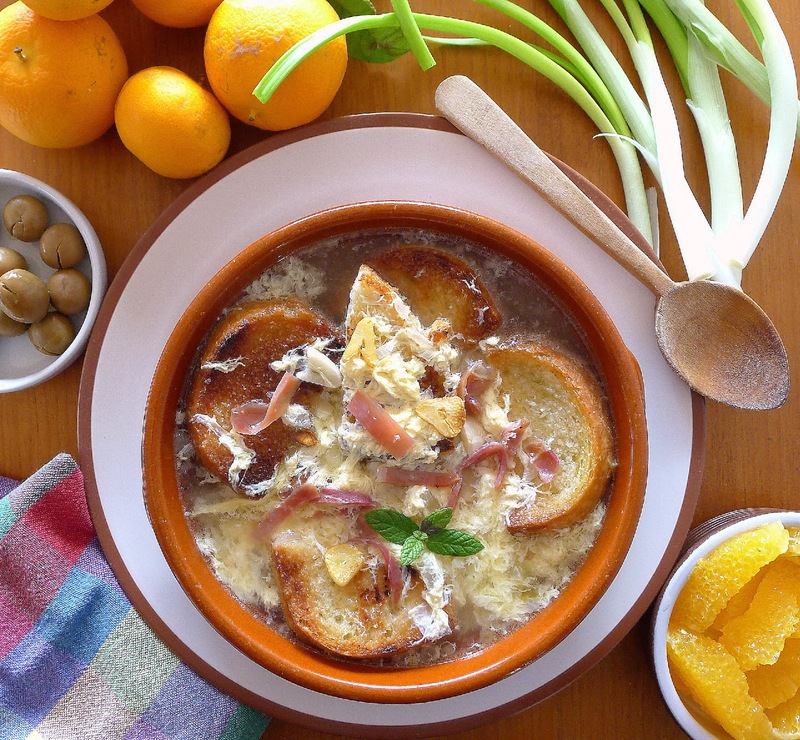 Or, you could make an orange-onion-olive salad to go with the soup. 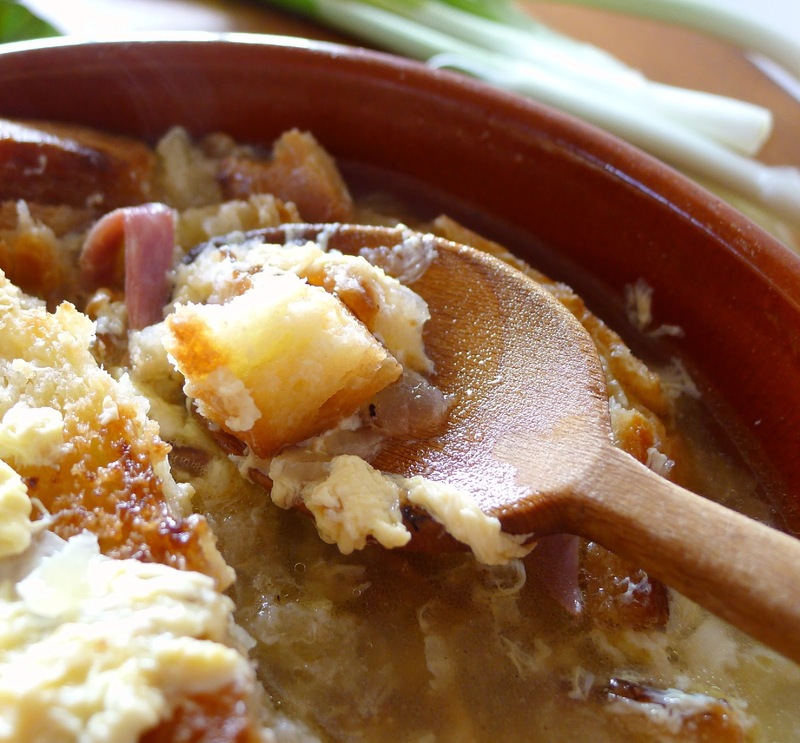 Hot soup with egg is ladled over the strips of fried bread. Alternatively, the bread is added right to the soup pot. The bread sops up some of the savory soup. Alternate spoonfuls of soup with a bite of green onion or orange. If you don't use well-seasoned chicken stock or ham-bone broth, be sure to add plenty of salt to the water. Pepper or hot chile is not customary, but who's to say it wouldn't amp up the flavor of plain water? Cut the bread into strips, removing crusts, if desired. 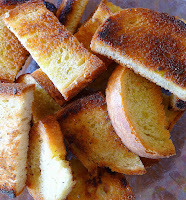 Heat half the oil in a skillet and fry the bread in two batches, turning to brown both sides. Add additional oil as needed. Reserve the fried bread. Add remaining oil to the skillet. Put in the sliced ham. Turn the slices once, but don’t let them crisp. Remove and slice into strips. Reserve. Fry sliced garlic till golden. 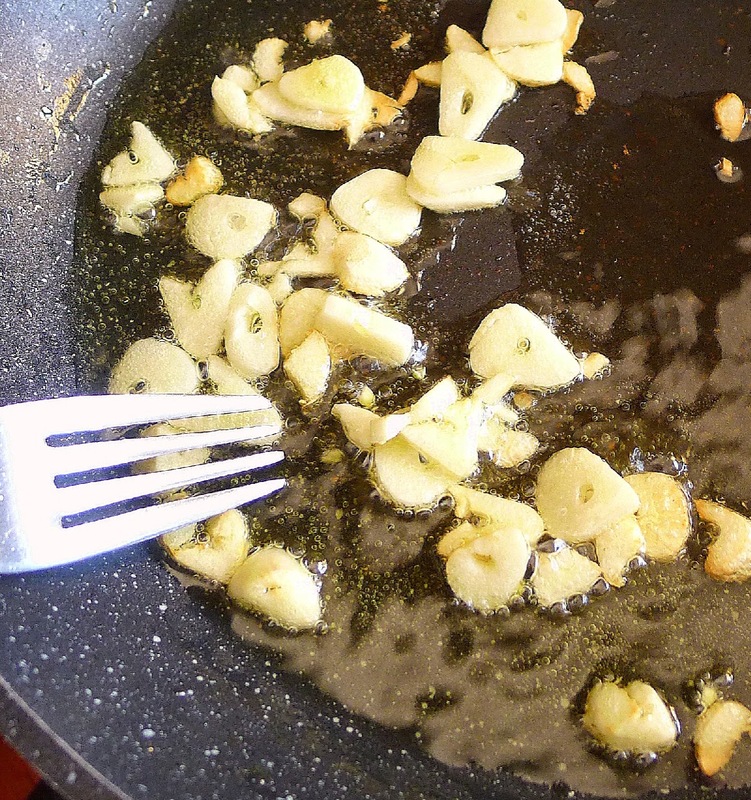 Add the sliced garlic and fry it until lightly golden. Skim it out and reserve. Add the chopped onion and sauté until softened, without browning, 4 minutes. Place the stock, broth or water in a soup pot and bring to a boil. 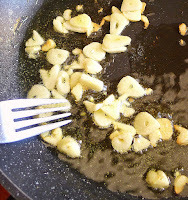 Add most of the garlic to the pot (save a few slices to garnish the soup) with the onions and oil from the skillet. Season with salt to taste. Cook 15 minutes. 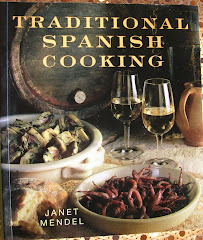 Divide the strips of fried bread between four soup bowls or place it all in a tureen. Stir the eggs together in a small bowl. Bring the soup to a rolling boil, then remove it from the heat. Stir the eggs into the hot soup. 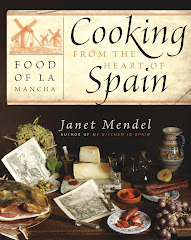 Immediately ladle the soup over the fried bread in the bowls. 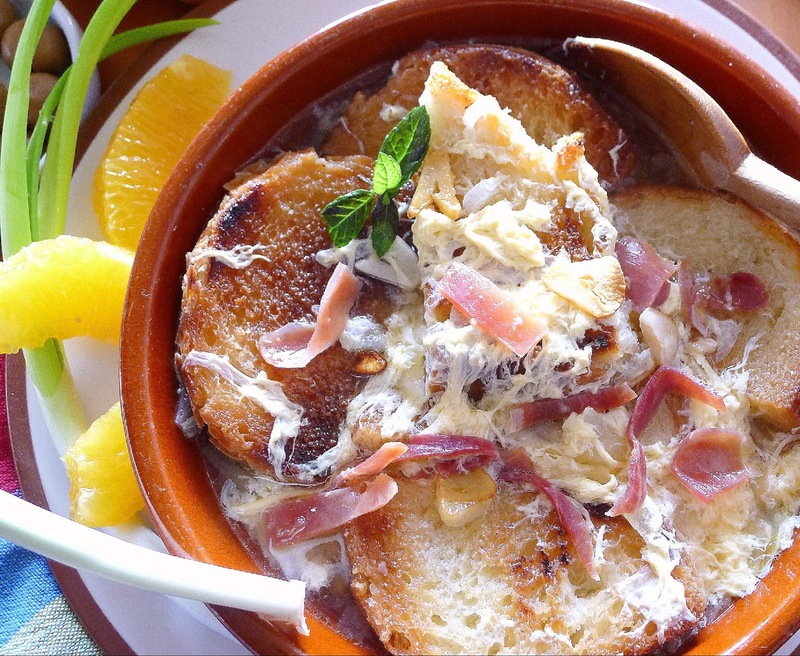 Garnish the soup with reserved strips of fried ham and reserved slices of fried garlic. Add a sprig of mint immediately before serving. 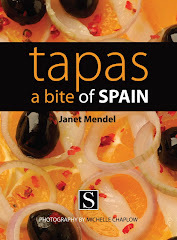 Serve the soup accompanied by wedges of orange, olives and onions. Variation: add spinach to the soup and poach an egg in the hot broth. Mallorcan "Dry" Soup with Cabbage. Tomato Soup with Bacon and Cheese Flan. Pinto Beans with Garlic Sauce.